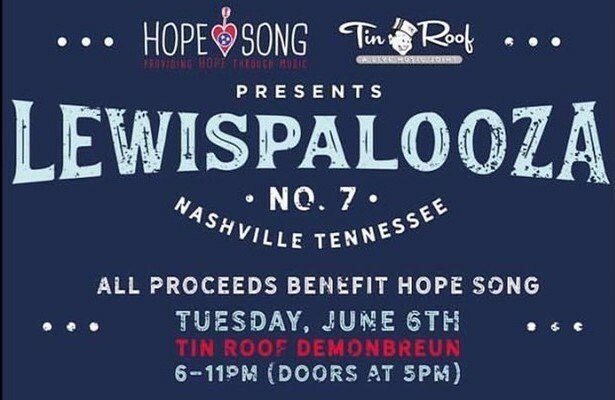 Jerrod Niemann to Headline 7th Annual Lewispalooza to Benefit Hope Song! Michael Ray and Love and Theft to Appear! Lewis Brice will hold his 7th Annual Lewispalooza to benefit Hope Song, a charity dedicated to providing hope to cancer patients through music, on Tuesday, June 6, 2017 from 6 PM to 11 PM (Doors at 5 PM) at the Tin Roof Demonbreun! Tickets are on sale now for a suggested donation of $20. You may also purchase VIP Tickets that include meet and greets with the amazing lineup for $50! Lineup includes: Jerrod Niemann, Love and Theft, Michael Ray, American Young, Lewis Brice, John Wesley Satterfield, Tyler Reeve, David Borne, Drew Dixon, Rob Snyder, Kristen Kelly, and Jimmy Stanley. Learn more about Hope Song here!